Amblimation was an animation studio of Steven Spielberg that was founded in 1989, with its headquarters in London. The studio produced three animation features. The first movie was a sequel of the 1986 Don Bluth animation classic An American Tail called An American Tail: Fievel Goes West released in 1991, followed by We’re Back! A Dinosaur’s Story from 1993 and Balto that was released in 1995. Harald Siepermann worked on character designs for We’re Back! A Dinosaur’s Story, a movie based on the same titled children’s book written by Hudson Talbott. Harald Siepermann did several designs of the dinosaurs Rex, Hatracks and Tiny, and the sinister circus director Professor Screweyes, for which he used actor Danny DeVito as a reference. Designs by Harald Siepermann for the characters Professor Screweyes and Rex for the movie We’re Back! A Dinosaur’s Story. 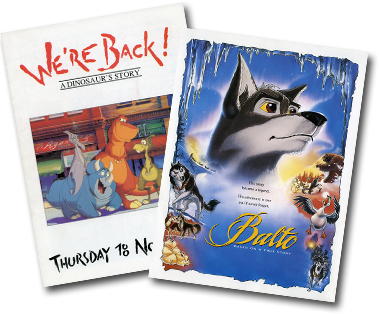 In the summer of 1993 production started on Balto, under the working title Snowballs. The movie was based on a true story about a husky dog named Balto who was the leader of a sledge dog team that, under difficult weather circumstances, had to transport medicine from Nenana, Alaska, to a little town called Nome, to save children from a deadly epidemic. Hans Bacher, who started to work for Amblimation in September 1991, was the Production Designer for Balto. When the studio was in need of additional storyboard artist he recommended the producers to hire Harald Siepermann and he showed them the Alfred J. Kwak comic books as reference. They were immediately convinced and Siepermann went to London in August 1993 to work for several months on Balto. Storyboard designs by Harald Siepermann for the last scene in the movie Balto. The Amblimation studio was discontinued in 1997 after Steven Spielberg joined forces with Jeffrey Katzenberg and David Geffen to form DreamWorks Animation in October 1994.